The Government Inspector is an Olivier Award nominee! Home / News / The Government Inspector / The Government Inspector is an Olivier Award nominee! 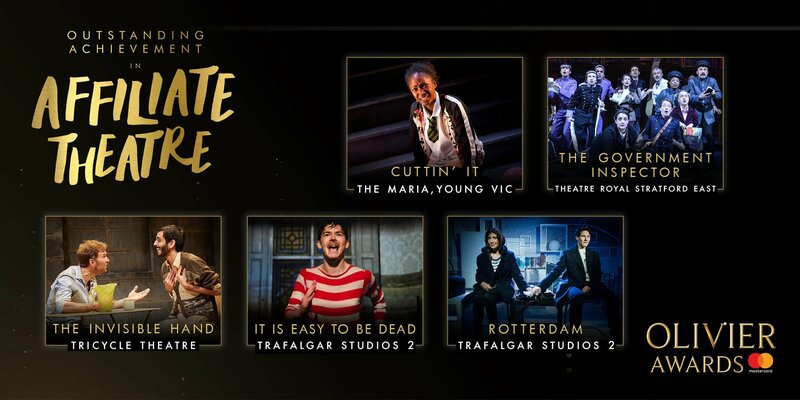 You may have heard this week that The Government Inspector has been nominated for an Olivier Award for Outstanding Achievement in an Affiliate Theatre! The production was the first of the block to tour the Ramps on the Moon consortium members in Spring 2016. It was produced by Birmingham Repertory Theatre, directed by their Artistic Director Roxana Silbert. 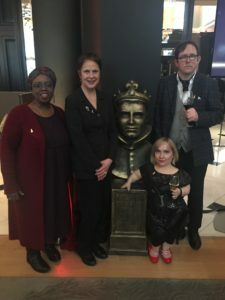 In attendance at at the Olivier Awards Nominees bash on Friday 10 March were Deborah Sawyerr, Executive Director of Theatre Royal Stratford East, Roxana Silbert, and cast members from The Government Inspector Kiruna Stammell and Simon Startin. Deborah Sawyerr, Executive Director of Theatre Royal Stratford East, Roxana Silbert, director of The Government Inspector, and cast members from The Government Inspector Kiruna Stammell and Simon Startin. The results will be announced on Sunday 9 April, right in the middle of the first Tommy run at the New Wolsey Theatre in Ipswich!